Restaurants and food trucks are both about to be obliterated by Peach and Uber Eats. The whole restaurant industry is quaking over this; it’s why you’ve seen some big restaurants starting up food trucks. But that won’t save them. The entire food truck industry is about to go tango uniform, disrupted by food delivery just as it was getting off the ground. Trucks will never disappear completely, because they can make money in local venues in good weather. But they’re not where the real money is. The best profit for small business owners now lies in food delivery. Well, that’s interesting. What is a restaurant? What is its purpose? Is it to provide ambience? Or to provide cooked food unique to its kitchen? And if it’s the latter, why bother with the overhead of a venue at all when only the kitchen is required? Think about that. Amazon has basically decoupled goods from physical stores. Now companies like Peach are looking to decouple food from restaurants. And then there’s something that could actually change entertainment. For example, imagine a drama akin to “Grey’s Anatomy” but shrunk to 10-minute episodes made for mobile consumption. Or a five-minute talk show, or a two-minute newscast — all with high-profile talent attached. I read that with a skeptical eyebrow raised. 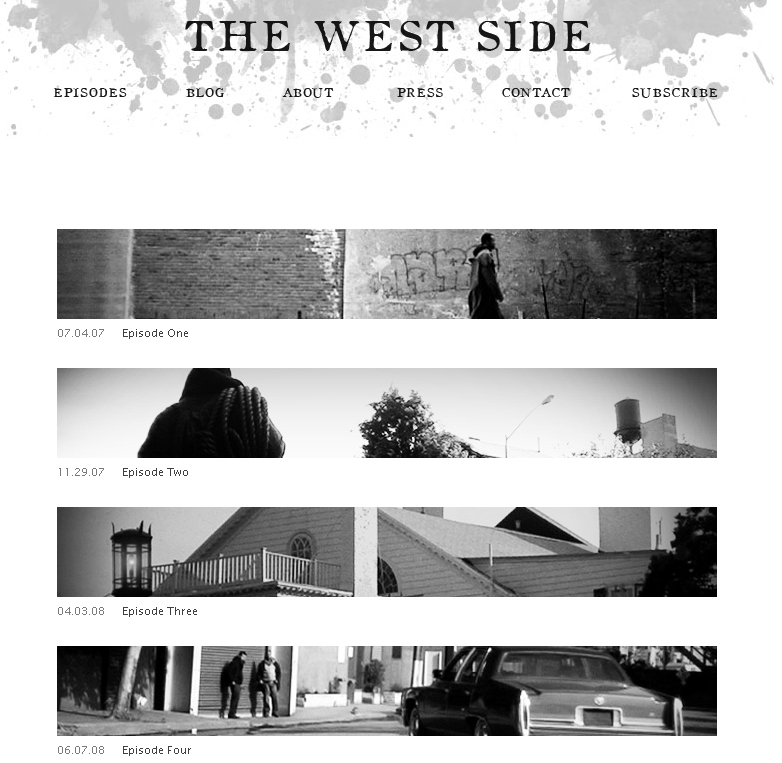 And ten years later, The West Side site is still up showing the only four episodes that were ever published. Those guys were ahead of their time. I re-watched all four episodes before doing this post. While a wee bit rougher than I recall, they still hold up as something unique and groundbreaking. Katzenberg doesn’t need Big Names for his venture. He needs hungry and creative “little guys” like the ones who did The West Side! In fact, I’d like to see him finance a damn reboot of The West Side. That would be badass. This entry was posted in Other Stuff, Video Services. Bookmark the permalink.